Twin probes will use a microwave beam, depicted by red lines, to track each other. MOSCOW, Russia (CNN) --NASA and the German Space Agency have successfully launched two satellites into orbit on a five-year mission to study Earth's gravity field. The twin spacecraft of the Gravity Recovery And Climate Experiment, or Grace, blasted off on top of a Russian-made Rokot booster at 1221 p.m. (0921 GMT), Russian space forces spokesman Sergei Derevyashkin told The Associated Press. The launch was the first of a NASA spacecraft from a site outside the United States. Plesetsk, about 650 kilometres (400 miles) northeast of St. Petersburg, Russia, is a former Soviet intercontinental ballistic missile site. Grace aims to map variations in the Earth's gravity field as it changes over time in response to shifts in sea levels, the ebb and flow of glaciers, the seasonal melting and freezing of ice sheets, and other such fluctuations. 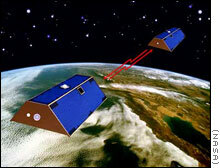 The twin satellites will fly in tandem about 137 miles (220 km) apart, circling the Earth 16 times a day. Subtle variations in Earth's gravity field will cause tiny shifts in the distance between the two as they orbit. The satellites' measurements of the distance between the two will be combined with data from the Global Positioning System, allowing scientists on the ground to assemble a composite map of the gravity field. NASA said that map will help researchers create precise digital global terrain models for use by geologists, oceanographers, hydrologists and glacial scientists. 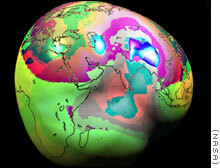 The maps will also be useful to scientists who study global climate change.